The £1 million project cost was too large for the congregation to fund on its own. It was decided that External Funding must provide not less than one third of the cost and its aim should be to provide half of the cost. External Funding is funding from sources external to the church eg the local community, local businesses, local Councils, National Lottery, Government and Charitable Trusts. 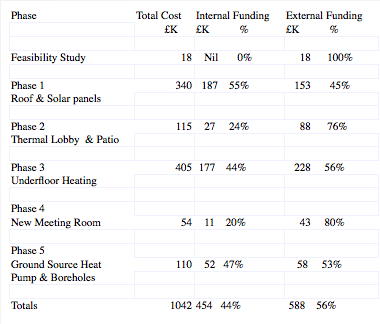 Project Plan A was for a quick dash to secure £1 million in a year and complete the project in about two years. It was found to be beyond the resources that we could devote to the project. Project Plan B was for a phased project which was funding driven so that a phase was started when sufficient funds had been secured. The project was divided into five phases and the previous Feasibility Study has been included to give the total project cost. The phased plan was successful in its aim of securing half the funding from External Funding for all of the phases, except Phase 1. In Phase 1, significant Government and Lottery funding would have been lost if the work had not been started by a given date. If there had been more time for fundraising then the target would have been met. The project was very suitable for funding from community, green and Christian sources. Green funding has almost disappeared over the last six years. 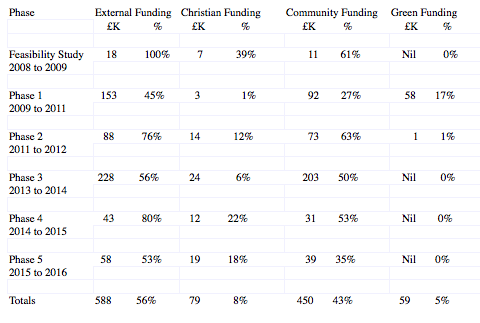 Christian funding was remarkably generous and consistent. Community funding was the main provider.